The Redentore celebration where the Venetians give thanks for the end of the 1576 plague is next weekend. But Venice is suffering from a new type of plague which isn’t contagious nor does it kill but it is annoying. Selfie Stick Seller – Getting update from his fellow sellers. 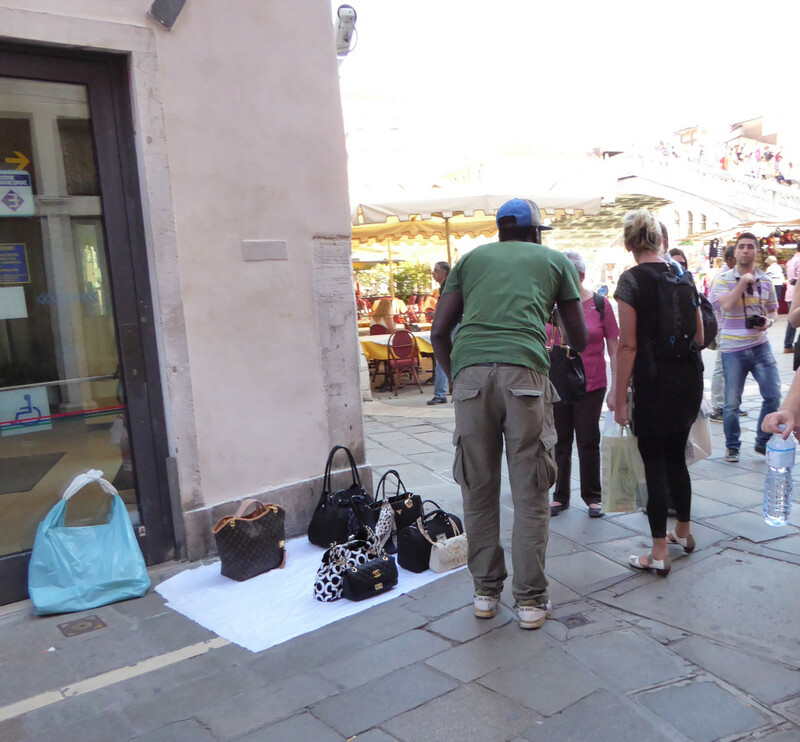 It is impossible to walk around Venice without being being accosted by the illegal street vendors, many of whom are themselves illegally in the country. Once the domain of the fake purses, the latest entries have the “selfie” sticks, bouncy lighted balls, lighted toy rockets, plastic boots, umbrellas. They are prepared for all purchasing possibilities. Others pedal roses, invading even your favorite restaurant, and let’s not forget the illegal grain to feed the unwelcome pigeons. The illegals selling roses create a real psychological dilemma, if you refuse to buy your loved one a flower, what does that make you? They target have their target market. 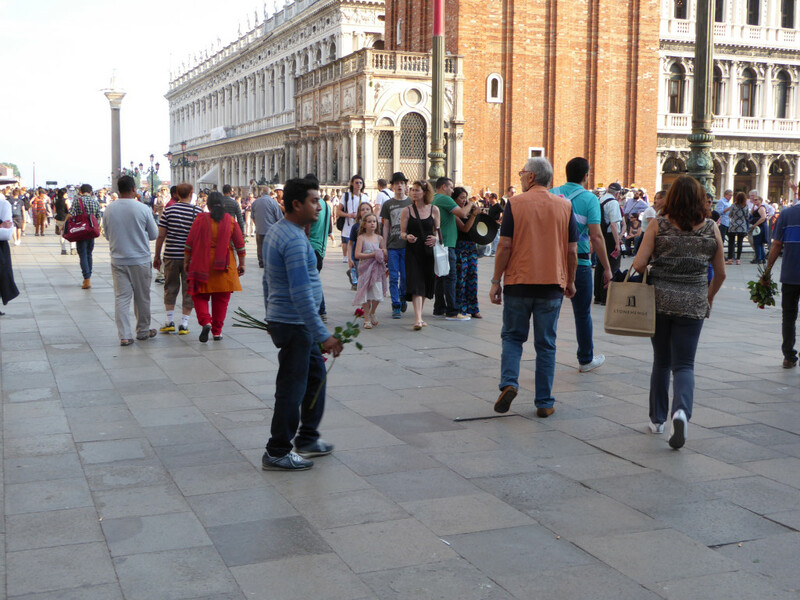 They put the long stemmed rose in your hands in this most romantic city and what can you do? It is organized, they have lookouts, and are constantly in contact with their brothers of the trade to alert the coming of the police. They originate from the war torn and impoverished countries of Africa, Pakistan, Bangladesh and Afghanistan mostly. The Africans appear to have the monopoly on the purses business and many of us suspect they are being supplied goods by some unsavory Venetian Merchants. The Pakistan and Afghanistan sell the roses, the toys, the selfie sticks. They never have many – just the few you see in their hands, making them less concerned about their goods being confiscated by the police. The police say trying to eliminate them is like emptying the ocean with a bucket. These immigrants have nothing to loose. 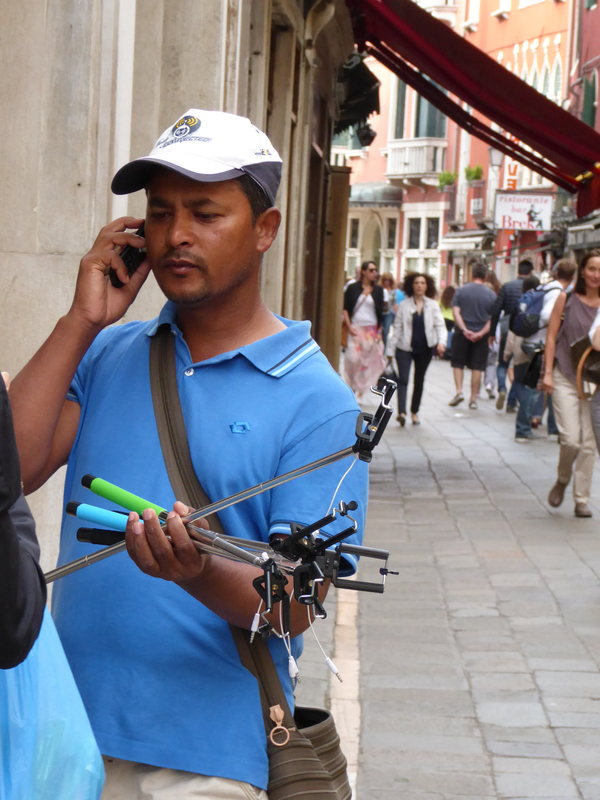 The selfie sticks they by from the Chinese suppliers for 3 Euro and sell for 8 Euro. In the last couple of weeks, the police seized 30,000 selfie sticks but the illegals from whom they took these, are back on the streets with new merchandise – so here clearly the winner is the Chinese importers! The fines and tickets issued by the police go unpaid and since they are undocumented – there is little the police can do. There is no way to track them, to enforce any fine or punishment. And they are now aggressive with reports daily by tourist of being threatened. The illegal vendors put the grain in the hands of unsuspecting tourist, reportedly preying on Asians with families, especially those with elderly and children. They arrive first with a smile and then demand payment for the gain, which by the time to pay the pigeons have already eaten. Tourist feel this is extortion. But maybe it’s a plot between the illegals and the birds who are clearly the winner. 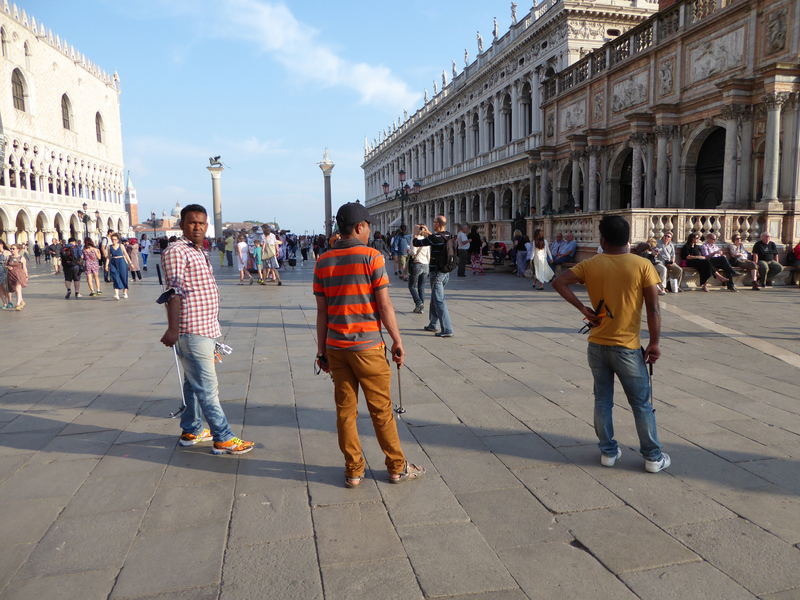 The main areas are, of course, anywhere tourist abound, like near the train station, along Strada Nuova, Accademia and of course Piazza San Marco. Those nuisance lighted toy rockets prevent any good picture of San Marco at night as it is impossible to get the sky without 5 or 10 in the picture. I’ve considered buying all their toys just to get them out of my pictures – maybe I could negotiate “no fly zone” time limit if I did so. How do you know they are illegal vendors? They are slouching on the walls with cloths thrown on the street with purses, toys, selfie sticks laid on them. The same if they are taking up space on the steps of the bridge so you can barely walk up or down, because you see they are counting on you being so polite you don’t step on the goods or the cloth. They are the beggars who arrive like commuters each day on the train. They have a bit of experience in human nature and how to exploit it. 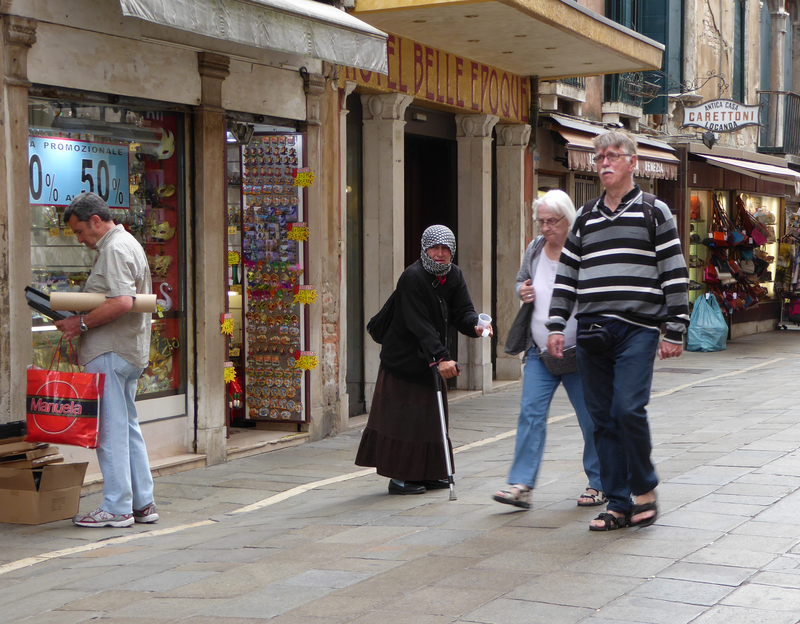 They are mingling in the crowds of San Marco – or other street with a handful of these same dollar store items. They have bundles of roses and are attempting to pass them out. They are shooting lighted toys in the air. And they call to you in your native language, Madam, Senora, Miss, they are adapt at languages and knowing which one you speak. They follow you after you say no. How should a tourist handle these vendors. First let me say IT IS IMPOSSIBLE TO OFFEND THEM! They have heard it all and whatever you say won’t be nearly as bad as the place from where they came. Being polite will not result in them going away. Say NO in a forceful voice. And continue with NO, followed by NO. 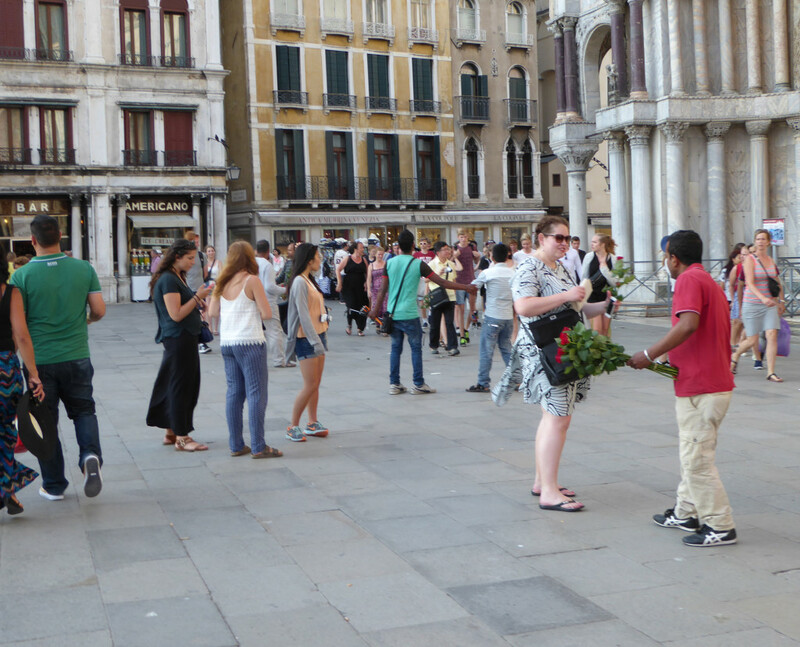 Do not let them put any roses in your hands, no bird feed in your hands, no selfie sticks. They do not want to draw the attention of the police so using a loud voice is a useful tool to send them scurrying. I do not think we can expect the Doge to save Venice from this plague! It is understandable that this is a big problem for legal vendors as well as a nuisance for nearly everyone else. In America we have Mexican immigrants– but they work hard. I empathize with your problem and know it’s a problem not just in Venice but across Europe. I don’t know the solution. I have to wonder though, in the last photo of the old lady with a cane with a cup outstretched– have we come to this? Where an old lady begging is a plague? Perhaps I misunderstood the photo and the focus is something/someone else. I hope so. Although I am not Catholic, I’ve taken great encouragement from the call of Pope Francis in his encyclical for all good people to stand up for the poor, our earth, the abused. It is a wonderful and saddening writing because there is so much to be done- but he calls for action. It should be read by everyone. Yes, it is difficult. As the local police/government says, they have nothing to lose and it’s better to earn a few Euro in a safe place than to be in their homeland. The old lady is part of clan of gypsies, tightly controlled by the leader. They commute like workers (pendolari) to Venice and have their assigned area and probably an amount she is to bring in each day. She too is just trying to survive. Sorry it’s a big story for just a few lines/pictures. I have been going to Venice since 1976. To give you an idea of how much I love Venice the past 10 years I have been there all but 6 of those ten years. All for extended time. In 2013 I rented an apartment for a month. This year we stayed nearly two weeks. I can testify that the problem has become 20 times (or more) worse in the two years from 2013-2015. I could not get over a bridge one over from the Bridge of Sighs for all the purse vendors. The lookout at the top was blatant in what his “job” was. I think it would help if the mass of people who get off the cruise ships (which should be outlawed from “driving by” so near but that’s another story)…anyway, the cruise people should be distributing rules to the people they disembark that includes do not buy things from these vendors and don’t feed the pigeons. That is a large group of tourists who could be educated. Also at the train station there should be a group of volunteers organized by the Venice city people who are doing the educating. Around the foreign exchange places too (foreign exchange places are charging 18%, another story, use your foreign fee waived debit cards or credit cards). If you want to hear my war story of having my debit cards hacked at an ATM located across from a guard at the front door of the bank let me know. Or I can tell you about renting an apartment for a month using Craigslist only to get there and find out it was all a scam. Thank goodness for Paypal as I got my money back but I was left with nowhere to stay. Oh, and that is the same week my debit cards were hacked. There is a woman wrapped in black dirty clothes who we have watched over the years. We noticed this year that her location had changed. She used to be near the Academia vaporetto stop. We have always wondered why the city didn’t move the beggars, such as her, out of island. The police seemed to just let it go by them as they did with the purses and other illegal vendors. Now the numbers are too large to control. 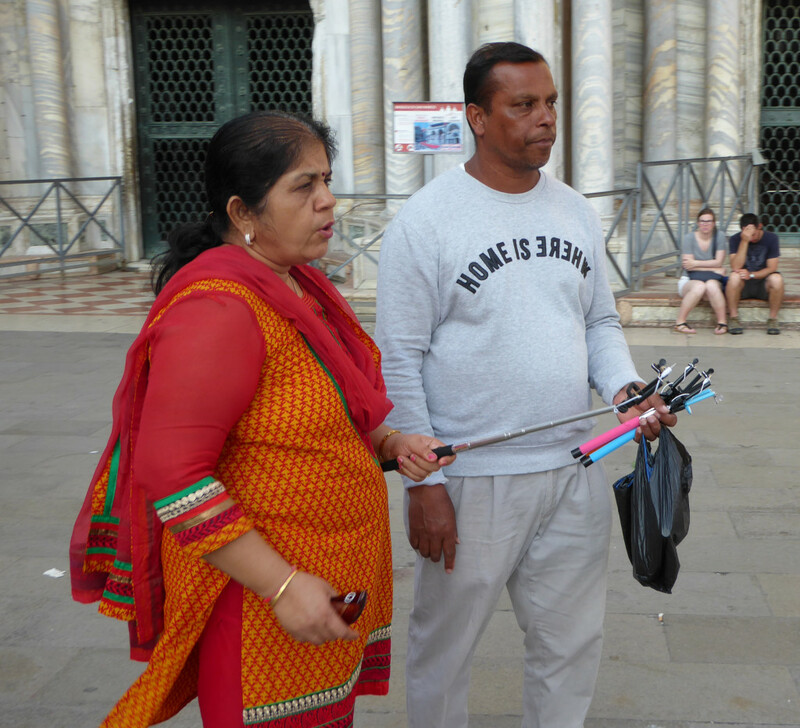 We saw a police woman in Pisa go up to a family that had just purchased a selfie stick for 20 euros. She took the stick from them and it looked like she was issuing a ticket for the purchase. They were really upset. At first I though why are the tourists in trouble but then I realized there were signs around saying not to buy from street vendors. 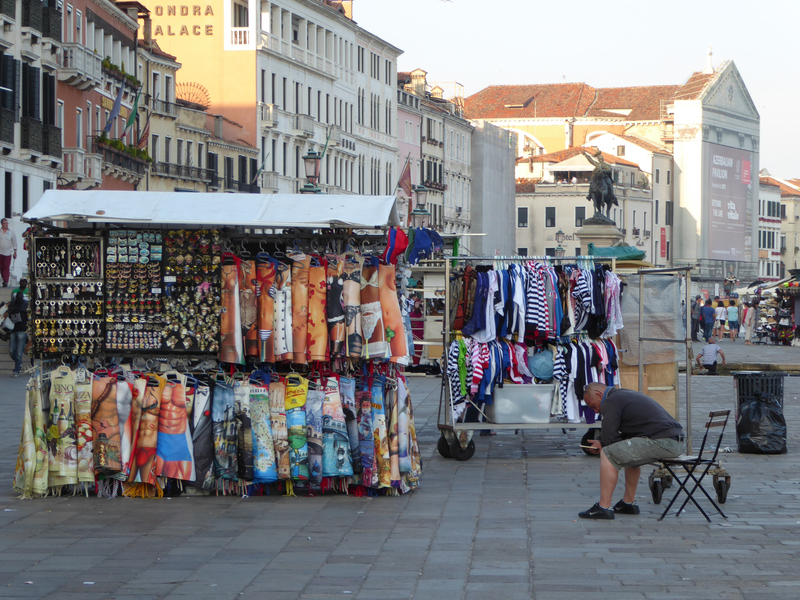 Venice should be making an active campaign of getting rid of the vendors. It has gone to far to expect the police to take care of it. But I LOVE Venice and I won’t let these people ruin my time there. Thanks Carol, glad to hear that you enjoy Venice for the beautiful city it is. The city has its hands ties in so many ways, starting with resources for the police, etc. Italian law is also not on their side and they ticket these people, haul them in, book them only to have to let the out again. Educating the tourist is a great way thing and I try in my small way with this blog. And I do know now that the cruise ships are beginning to talk to the tourists about these abusive vendors. Regarding the cruise ships, I am on your side as you can read from some of my blogs. My opinion is not shared by all my Venetian friends. We have just agreed to disagree. Sorry to hear about your experience renting an apartment. As you probably know by now, the owner wants only a small deposit and wants the balance in cash. I would be skeptical of anyone wanting total payment through paypal. I have rented for about 20 years as well, but I do have the benefit of locals and in fact keep the keys to one apartment as I use so often, no one need meet me. One apartment, they just leave the key under a flower vase for me. Another they just block off for me for the months they know I come. As we work in Venice and Murano, we have very specific needs of an apartment: 1)Super fast internet and most Venetians and tourist do not need this, so it limits us significantly. 2)Be in Cannaregio for quick access to both Venice and Murano and the mainland. 3)Must have a real kitchen, stove with an oven, (not 2 hot plates) and a table to sit lots of people as we entertain a lot there with our local friends. 4)No “classic Venetian” (read here “old, fragile” Furniture, we take kids, we invite locals, we really use the apartment. 5)Air-conditioning – no explanation needed here. As sometimes we are 9 people I have different needs on different trips. So I have my list for 2 people through 9 people. And we generally stay 3 weeks each trip. I would be happy to share my rental information with you or anyone else who is interested in staying in Venice. Just send me a note through our website “contacts” page at http://www.venetianbeadshop.com. And we can all share our experiences if you choose. I get “homesick” for Venice after being away for about 2 months. It has a way of becoming your home. And my favorite time of day is when the “tourist” go to their hotels, to their cruise ships and the locals come out and have an umbra and just gossip. No better place to be! Who can we make complaints or reports to? My husband and I bought a parasol from a vendor at the main Venice bridge. We gave him a 20 and our change was supposed to be 12 euros, but instead gave us 2 and claimed we only gave him a 10. We had just withdrew cash the day before- all we had were 20s. I wanted to wait for the cops but no one knew how to call. Sorry Areli for your unpleasant experience. Now that you are out of the country, it is probably impossible. But for your future information, to call the Police, you can call 112 or 113. (Like 911 in the US). There is certainly someone who speaks other languages there. But also for future information. the best tactic might be to yell loudly attracting as much attention as possible, these guys do not want to bring any unwanted police attention to themselves. They absolutely understand what you are saying. Many of them speak multiple languages.